eMarketer estimates that US business-to-business (B2B) advertisers will spend $4.07 billion on digital advertising in 2017. The B2B digital ad market is growing steadily, and in 2018 it will jump 13% to reach $4.60 billion. Desktops and laptops attract the majority of digital ad dollars spent by B2Bs in the US—an anticipated $2.54 billion in 2017. Mobile spend, which will reach $1.53 billion this year, is increasing steadily every year and slowly eroding the desktop/laptop share, although no tipping point is in sight yet. The B2B digital ad market is dwarfed by total digital ad spending (which is more than 20 times larger) and total media ad spending (more than 50 times larger) in the US. While business-to-consumer (B2C) companies still drive the clear majority of spend and will likely continue to do so, at many B2Bs the media mix is evolving, with a stronger emphasis on digital buying and placement than in the past. This change is led mostly by big-spending, high-tech B2B companies. B2B advertisers are attempting to build technology infrastructure to help execute as well as measure the effects of digital advertising. This investment in the stack is taking up a sizable portion of B2Bs’ digital budgets, meaning that those dollars aren’t available to be spent on actual media. The most sophisticated B2Bs are focused on data collection and analysis, which enables more effective reach and audience targeting. Machine learning, account-based advertising techniques and programmatic buying present B2B advertisers with opportunities, but they can also be difficult to use. Ad platforms, agencies and B2B brands are shifting their digital media buys to be more audience-centric—meaning ads are meant to be targeted and displayed at the right place, at the right time. This is in contrast to planning individual channel-, device- or campaign-centric strategies and budgets. 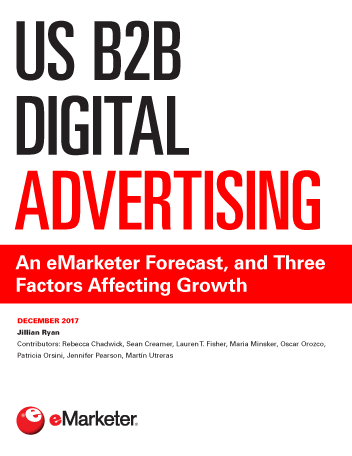 "The US B2B digital advertising market will more than double between 2013 and 2018. In 2013, B2B advertisers spent $2.18 billion; that number is projected to grow to $4.60 billion next year."